Trucks are great vehicles. For some drivers, they’re the perfect solutions for work, play, and everything in between. However, if you’re considering a pickup truck as your next ride but you’re unsure as to whether or not it’s REALLY the right ride for you, then it’s time to turn to Toyota of N Charlotte for help. Today we’re talking about the pros and cons of trucks to help you decide if this type of vehicle is a solid solution for your unique drive time needs. Let’s get started! What are the upsides of owning this particular type of vehicle? Here’s what the facts (and our N Charlotte Toyota customers) are saying. Off-roading abilities are better. You’ll be able to take things off the pavement a lot more safely and efficiently than you would in a car if you own a pickup truck. 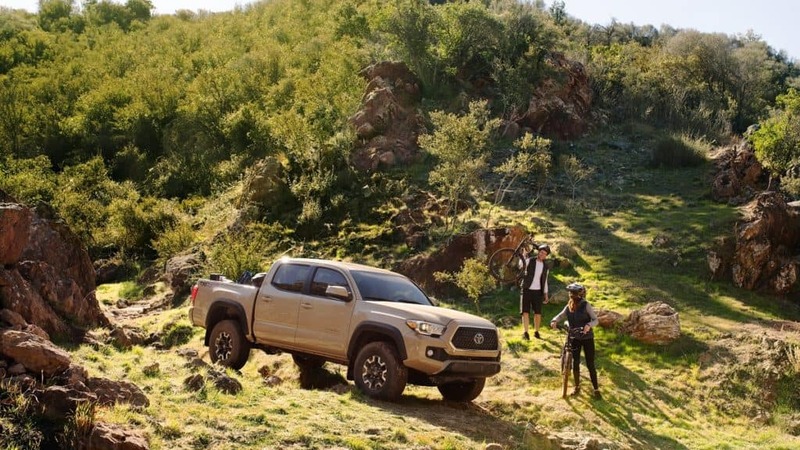 Our N Charlotte Toyota trucks are equipped with features specially designed for off-roading, like active traction control, four-wheel drive, tow hooks, CRAWL control, Multi-terrain select, off-roading tires, skid plates, and more. Passenger cars and most SUVs can’t hack it on the trails. You’ll have more power for towing and hauling. Pickup trucks offer more horsepower AND torque, which means a more powerful performance. They also are constructed to be able to handle heavier loads when hauling, so piling furniture in the bed is no big deal. Plus, all that torque means you can tow a lot more with a truck than you can with a car – the N Charlotte Toyota Tundra can easily pull over 10,000 lbs. They’re just as spacious as other options. If you want interior space AND cargo space, a truck is a solid bet. Nowadays, you can find truck cabs that easily fit five people comfortably. And the bed offers a unique storage solution that can handle everyday items like groceries all the way up to furniture. You’ll have plenty of space for people AND cargo. But what about the cons? Here are some of the aspects of owning a pickup truck that could be downsides for you depending on your drive time needs. The fuel efficiency doesn’t compare to passenger cars. Pickup trucks are larger and heavier than cars and also have bigger engines. All that power you need for towing, hauling, and off-roading is the trade-off for better fuel efficiency. They’re big. Trucks are big – after all, you’ll have all that interior AND bed space. If you’re not a fan of piloting a large vehicle, you may want to consider other options. You have fewer options when it comes to models. There aren’t quite as many models available in the world of trucks as there are in the realm of cars. However, our N Charlotte Toyota trucks are very customizable, so it shouldn’t be an issue to find all the features you need. Don’t take our word for it – take a test drive! Toyota of N Charlotte is located just off I-77 at exit 23 in Huntersville. 0 comment(s) so far on What are the pros and cons of owning a pickup truck?